Halloween parties are a great excuse to trot out a limited-edition movie-quality costume based on the film version of your favorite foreign graphic novel. But they're also a great excuse to wear a much simpler and less obscure outfit like this, which some people will really appreciate. 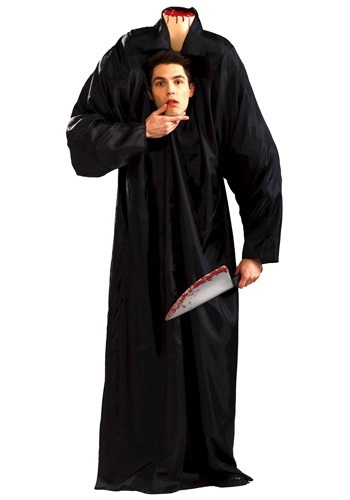 Because this Adult Headless Man Costume doesn't require a 20-minute verbal plot summary, or an in-depth explanation of unfamiliar cultural norms and the limitations of translation. All you need to know to get this gory gag is that the head bone is supposed to be connected to the neck bone--and it no longer looks like that's the case! Hey, we're nerds. Our closets look like the coatroom at a comic book convention. Of course we like a good story, colorful characters, and elaborate cosplay. But sometimes being a one-man fandom gets exhausting. Sometimes it's nice to give your custom PVC armor the night off in favor of a classic decapitation illusion like this. And if you have some kind of rule against wearing a costume when you're not familiar with the lore, you might want to scare up a copy of The Legend of Sleepy Hollow. Or not! Because this look is more grisly ghoul than headless Hessian. It's not a test of anybody's commitment to authenticity: it's just a spooky trick and a goofy treat rolled into one convenient package. And if someone wants to grill you about the origins of this outfit, just tell them to talk to the hand!